There once was an alien called Crush, who’d get annoyed whenever she’d blush. But then, one day, her blush, went away, when it was replaced with a severe case of Thrush. Want to know more? 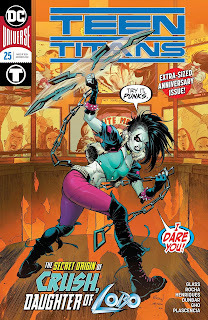 Then please ignore the following adventure created by Adam Glass, Max Dunbar, Robson Rocha, and published by DC Comics in January, 2019. TO QUOTE William Shatner: 'We meet aliens every day who have something to give us. They come in the form of people with different opinions'. One night, fifteen years ago, two lovebirds from America miraculously found a young, alien child, stranded in the middle of a barren field. Well, to be more specific about it, the child was a baby from the planet Czarnia, named Crush, whereas the two lovebirds were two potheads who smoked dope, named David and Lisa Rojas, and together, the three of them lived a rather wild and happy life until they eventually got killed by a drug dealer. Part One) CRASH NOT BURN: When DC Comics initially announced that they were going to create a young, female version of Lobo, I honestly wasn’t too sure if I was going to like her or not. Well, let's face it, they’ve already tried to de-age Lobo years ago -- the Slobo variant -- and overall, the concept they came up with was so ill-conceived, it was fairly laughable at best. Basically, he was a teenage brat, a brat on legs, who tried to live up to his more illustrious predecessor by being loud, obnoxious, and as stubborn as sin. So, with some benefit of hindsight, I'd say he was generally perceived as being a fairly disposable character that in some way hindered Lobo’s legacy. 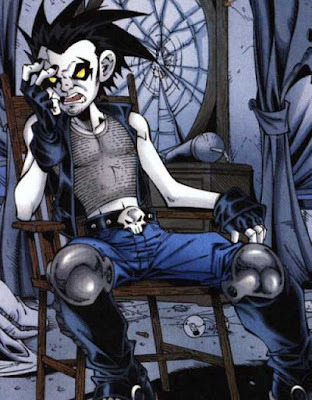 On a side note: You might like to know that Slobo: The Clone of Lobo, made his first appearance in the pages of Young Justice #38, circa December, 2001, and was eventually killed off by a swarm of Darkseid's parademons in Young Justice #55, circa May, 2003. Anyway, as I was saying, I wasn’t too fond of Crush when I first heard about her joining the group, as I truly thought DC was going to make the same mistakes again. But no! I needn’t have worried, really, because this time around they were able to fix their previous errors by making Crush into a more fully-fledged character that still paid homage to the original. After all, she does tell jokes, but she isn’t too jokey; she does show some attitude, but not too much to put people off; and I like to think she’s fairly likable too, albeit in a more realistic fashion than before. Part Two) CASH BUT NO: ... I can’t really criticize it in any way, shape, or form. Seriously, folks, on the whole, this is one of those self-contained adventures that smartly ticked off quite a few boxes in the positive column. For a start, it’s a personal story (check) about an interesting character (check) who tells us about her own origins (check) before accidentally tracking down an evil person who’s directly involved with it (check). 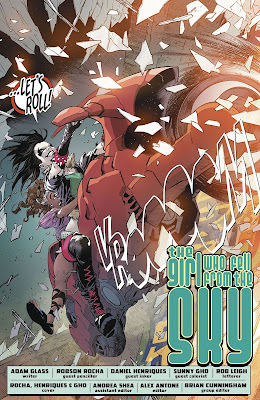 What’s more, the art by Robson Rocha was clean, crisp, and very vibrant on the page (check), and overall, it possessed a lot of fun and interesting ideas that varied in scope, ranging from Crush’s sentient chains (check), to her final end-game dilemma (check), to her funny trip to the diner with Djinn... (check)... and mate. Although, come to think of it, if there was one thing about this story I wasn’t too keen on, it would have to be the fact that Crush hasn’t confronted Lobo yet. I mean, between you and me, I would’ve thought that she’d at least try to track him down by now, especially since Lobo was previously a member of the Justice League of America, and she could have got to him via Robin’s father, Batman, who was once his leader. Besides, apart from the way she looks, there's no real evidence to say that the two of them are actually related, although it is fairly obvious that they come from the same planet (or are members of KISS, wink!). Along similar lines, I was also slightly taken back by the notion that people who constantly take drugs can bring up a child without any real reprisals. Well, without trying to sound too judgemental (Heaven forbid), over the years I’ve known quite a few people who’ve ‘Chased the Dragon’, and even though most of them were nice people, warm people, and genuinely pleasant people, who wouldn’t want to cause anyone any real harm, in the same token, I don’t think any of them would trust themselves to look after a child -- properly -- for a prolonged period of time. But then again, maybe this is just me talking out of my own arse, because, at the end of the day, this story, this creative team, and these characters were fantastic to follow, really fantastic, and all in all, this issue is definitely worth picking up for the price of admission. So, what do you think, dear reader? Did you like this episode? Did you hate it? Or are you a bit like me? Generally in favor, but in retrospect, there are a few notable squabbles along the way. Either way, please let me know your thoughts in the comment section below. 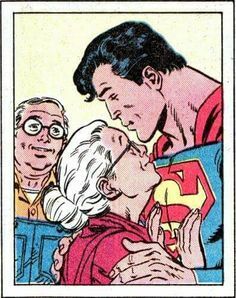 If Martha and Jonathan Kent smoked a barn full of pot, then I’m sure they would have turned out to be like Crush’s foster parents, David and Lisa Rojas, although a tad less urban and a tad more hip. So, with that said -- yes, you guessed it -- I'm now going to compare a punk version of the Kent's to this very episode. Being blown up by a nuclear warhead. So, can you guess which options are true or false? Go on, have a guess, and let me know what you think in the comment section below.